Kids, Cows and Grass: Beef Enchilada Soup--freezer to crockpot! 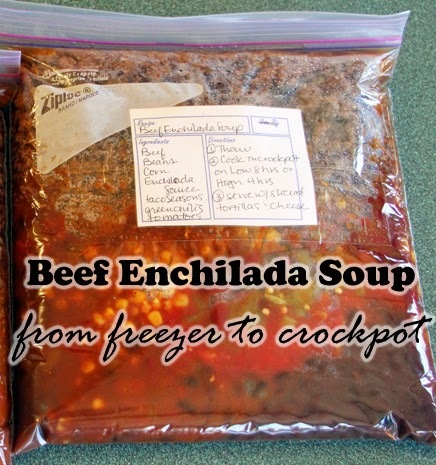 Beef Enchilada Soup--freezer to crockpot! I have two very special friends for whom I would seriously walk through fire--in fact I wrote about them on the 4th day of Christmas. Both of them have recently been going through a pretty rough time--one lost her nephew in a car accident and the other has been diagnosed with stage 3 colorectal cancer and has begun treatments. Bam! My life has changed again! From being the caregiver of my son as he recovered from a liver transplant, to being on the support crew for my buddies. And what better way to show them my love but to cook for them? What's on the menu? BEEF, of course! When you are hit with a difficult time, the first thing that people always ask is, "What can I do?" Unfortunately, the usual answer is, "Nothing, thanks!" But in a small town, we don't wait to find out what the answer is, we just bring food! If you are going through a rough time, or lost a loved one, or are dealing with a health issue, you will find yourself the recipient of multiple homecooked meals. If you have read my blog for any length of time, you will recognize my Beef Enchilada Soup recipe. But here is a new twist...as I searched Pinterest for new recipes, I happened on a bunch of "freezer to crockpot" recipes that you store in a ziploc bag and dump it into a crockpot when you want to eat it. My soup is perfect for this and I was able to divide the soup into two bags and make it a more manageable amount, as well! ....and don't forget 4 lbs of ground beef! This is very lean beef that we raised. 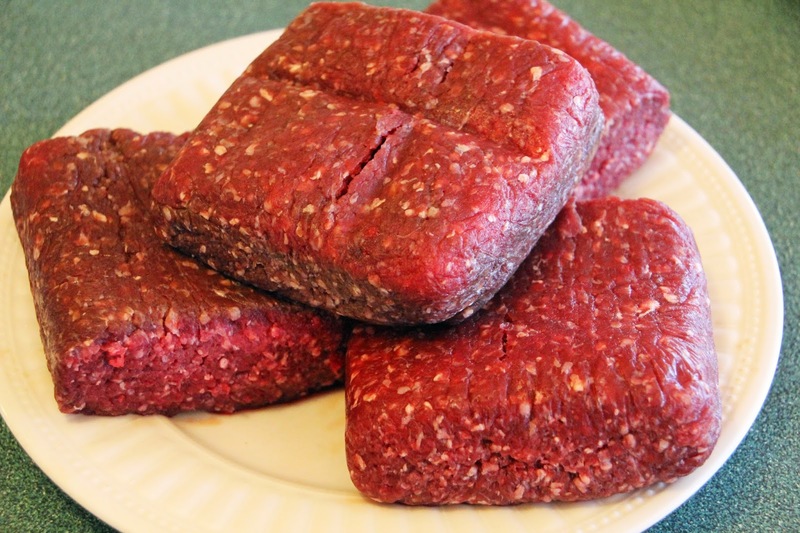 I actually often have to tell the butcher to add fat to our ground beef. But this ultra-lean meat is perfect for casseroles or soups so there is very little fat to drain off. So no matter how you are making your soup (to consume the same day or to put in freezer bags to save), you now brown the ground beef and break it up into small pieces. If your beef is not as lean as this, drain it, then put it in a colander and run hot water over it to rinse away the extra fat. Now, if you are eating the soup the same day, you just dump the ground beef and all the other ingredients into a crockpot. But I made it to eat later, so I used two gallon-sized freezer bags, printed out a recipe to tape onto the outside of the bag and then I put half of the ingredients in each bag. The recipe on each bag lists the ingredients (although not necessarily how much of each) and how to prepare the contents to eat. I suggest the day before you intend to cook the soup, take it out of the freezer and allow it to thaw in the refrigerator. The day you plan to serve it, simply dump it into a crockpot, turn it to low and walk away! You can cook it on low for 6-8 hours, or if you are in more of a hurry, you can turn it to high for 3-4 hours. Carefully press out the air from the bag, as you zip it closed! Be sure it is closed--it would be a huge bummer to pick the bag up from the counter and have it pop open to dump delicious Beef Enchilada Soup on the floor for Roo the Cowdog to lick up! 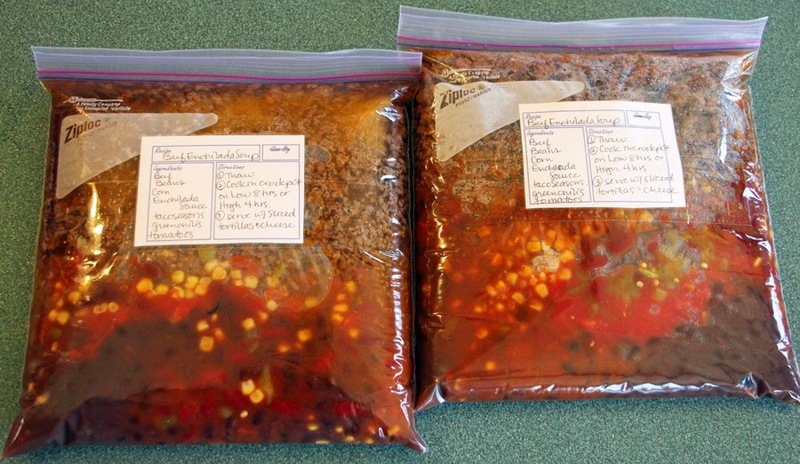 Then head to the freezer and lay the bags on a shelf so they are flat and let them freeze for a few days. The only thing left to do is to call up your friend and deliver this bag of yumminess to her freezer! And...I kept one for myself. The hubby and I will very soon be empty-nesters and I have plans to cook LESS FOOD and learn to cut the carbs for us. Without teenagers/young adults and their high metabolism hanging around, I find that I move slower and eat less. But, this is one of the healthiest and easiest comfort foods around. So spread the love--share some soup--and make a friend's day. Want more? Check out my Pinterest board for Recipes to try! My favorite freezer-to-crockpot recipes are easy to find there. 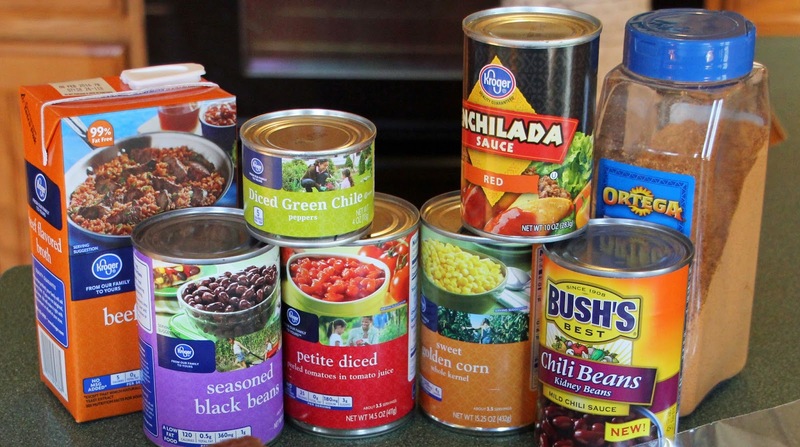 Do you happen to have ounce measurements for the cans and cartons listed? Stores have such a variety of sizes available and I want the soup to turn out. Melanie, I totally understand, but I will say that it really doesn't matter--sometimes I use a bigger can of tomatoes, and sometimes the smaller. The cans in the picture are all around 15 ounces, except the green chilis and it is the 4 oz can. I used 32 ounces of beef broth...one carton. THANKS for asking! I'll update in the recipe soon! Yummmmm. I'm making a batch down here in Houston! ...and you will have more in your freezer at home! I'm delivering a load of freezer-to-crockpot meals for your family today!! I know you can feel God's love, but I also want your family to feel wrapped in His arms as well! I love this line "But in a small town, we don't wait to find out what the answer is, we just bring food!" I've done this several time for neighbors in Colorado and they seem so surprised by the gesture. It's just what you do! Love it; makes me smile. Leslie, I know...I guess not everyone can live in a small town--or there wouldn't be any around! But whenever someone gets bad news, the whole community shows up with food!